The perfect self contained holiday or relocation unit. Fully equipped with secure off street parking. Walk to beaches, shops, and transport interchange. Swim or scuba dive from the jetty & reef. Let yourself in at any time: self check in by means of combination key safe outside of the house (no issue with arriving late). Wine Region 12 min away. Easy access to Kangaroo Island and Fleurieu Peninsula. Easy access to the city via the southern expressway, and less than 15 minutes from Flinders medical centre and university. Please enter your dates for long term stays to see the off peak discounted prices. Quality short stay accommodation in popular seaside suburbs. Our fully furnished and equipped privately owned houses, cottages and units are in Adelaide South Australia. Perfect for your holidays, attending a conference, a business trip or independent travel, an alternative to a hotel, motel or a long term lease, for romantic getaways, family vacations, migrant accommodation, work relocation or interim accommodation when moving house, renovating, building or before settling permanently in Adelaide. Perfect for relocations: Ideal for a single person or two adults. Sorry not suitable for children or pets. 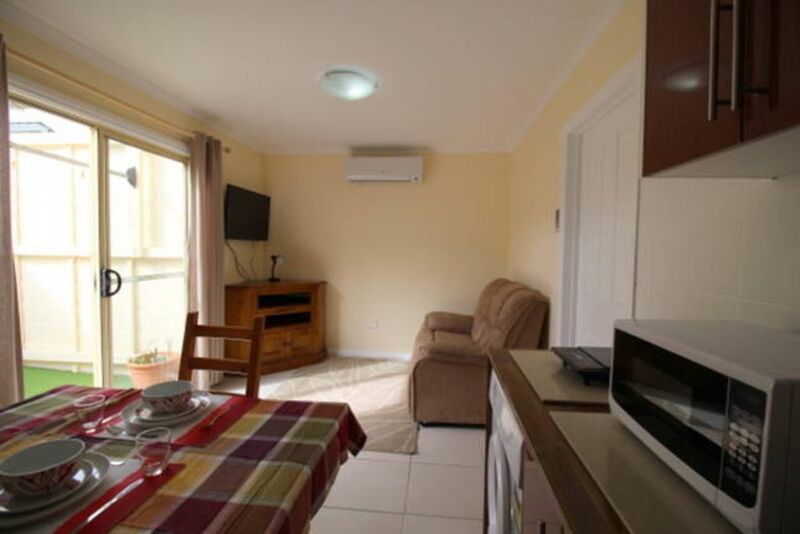 If you are looking for a holiday or furnished migrant rental and looking for a quality short or long term furnished rental home in Adelaide South Australia, then look no further. Our short and long- term on arrival rental accommodation offers you furnished house rentals that are within walking distance to beaches, shops and transport. Ideal for a single person or a couple. Garden cottage is situated in the grounds of Oceanview House next door to Tobies place (also available on Stayz as a furnished rental). For the best equipped and furnished houses in great locations, our Homes Down Under will cater for your short or long term stay. We have the perfect rental homes whether you’re looking for a quality furnished holiday home, arriving as a new migrant with your family, or visiting as a corporate client. If you take a look at our furnished rental homes in Adelaide you can choose a property that suits you and your budget. Swim or scuba dive from the jetty. Ideal location when moving or having a holiday in Adelaide. Port Noarlunga Beach if you are a scuba diver, snorkeler, paddle boating or surfing. Port Noarlunga has a reef to go and explore. Line fish off the jetty go kayaking or swimming. Come & explore . Port Noarlunga Village has everything you could want. Restaurants, coffee shops, bakeries lovely beach atmosphere. Come and explore this beach side Village. The Garden Cottage was very clean and fully equipped, ideal for the couple wanting privacy, very safe and secure location, very quiet, major shopping mall nearby, leisure centre with large indoor pool within walking distance. Thank you Daniel Glad you enjoyed your stay. Look forward to seeing you again with the family.